hey, my parents are in town this weekend! they landed at jfk this evening and got in a cab, then got out of a cab and stepped into our doorway, and not two minutes after they'd barely sat down and started to ease in i launched myself at my mother with full force and literally talked a hundred miles a minute at her for two solid hours. all about myself. ME. i have had the kind of week--the past three weeks in a row, actually--where bombs of chaos keep dropping. psssszzzzzz BOOM. and then instead of being the kind of bomb they started out being, they'd change in midair sort of and land completely not how i expected them to land, sometimes softer and sometimes weirder... morphing disasters, in kind of a comical way actually, and i have things to sort out and the bad news for everyone is, i sort things out verbally. by talking at you. taaaaaaaalking aaaaaat youuuuuu. honestly my mom got here just in time (making this the third freakishly serendipitous situation i've found myself in this month), because otherwise i was going to have to talk my feelings out at BRANDON and look, we all know how effective boys are at sorting out the inner workings of a woman's brain. the good news is everything is fine, and actually, things are looking up. most of the bad news has become a blessing in disguise, except for the stupidly bad news i got last week, in the "you are way more infertile than you thought you were and may never have any more children" vein, only to have that reversed to "just kidding! but yeah, you're still as infertile as you thought you were, here let's throw some more drugs at you." which was where i was before, you know, only the difference is before it felt pretty crappy, and now it feels like a vacation! compared to what it almost was. i'm just saying, i'm all over the place. it's a long and very involved story and, like i said, still sorting through over here, but the conclusion seems to be thus: everything is going to be great. i have no freaking clue what i'm doing. i am going to try really, really hard to become a more gracious human being. and i'm lucky to have good parents. and a patient husband. okay well he's patient about 70% of the time, but also he deep cleaned the house for me yesterday so that more than makes up for things. anyway the reason i came here was because in the middle of all this nonsense i baked some stupidly good cookies (therapy baking!) in exchange for a black sweater i'd forgotten somewhere (gratitude baking!) and so here we are. this makes a really thick dough. 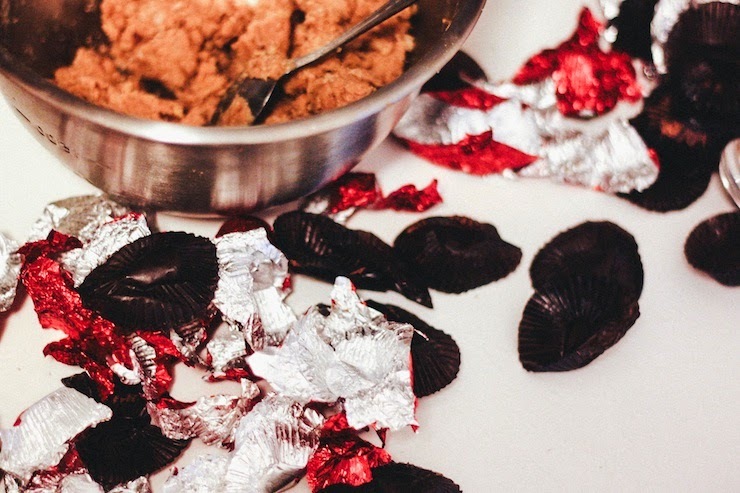 roll the cookies into balls then flatten with a spoon or your hands on a greased cookie sheet. don't forget the fork marks, you know. at the last minute i rememebered i had a costco bag of peanut butter cups sitting around and so i thought, why not! i'm sort of on a cookie roll! for my next trick, i want to try and figure a way to make banana bread in cookie form. if you know of a recipe that exists for this already, please pass it on! i don't know, it just seems like banana bread cookies would be mind-blowingly good. this post has been all over the place. and good night! YES to the therapy baking. It is a thing. And it helps, tremendously. I think you're one of my favorite people on the internet. You always make me laugh. And I also just have to say for some reason I love how you publish all your posts late at night. Everyone else schedules theirs for 8AM but you're my late night read--and late night laugh. Your little boy is adorable, btw. I so have you covered on the banana bread cookies. My mom has been making something along those lines my entire life with chocolate chips of course. I'll email you! "but the conclusion seems to be thus: everything is going to be great. i have no freaking clue what i'm doing. i am going to try really, really hard to become a more gracious human being." This honestly brought tears to my eyes. Totally different situations, of course, but yeah, I'm right there with you. I read that article last night and found myself agreeing to literally every statement. therapy baking totally helps. these sound amazing! Oh yes, the love of peanut butter! Scrumptious!! Thank you for always being so positive. Sometimes it's nice to be reminded that yes, sometimes life really blows, but everything is going to be okay. therapy baking and chats with mom, it's what makes the crazy world go 'round. give that sweet little boy a kiss and that big sweet boy a bigger kiss. seems to work in our house. these sound like the perfect cookie for me. maybe add a little sea salt right on top? elevated! as for banana bread cookies, hmmmm, i think you should use a chocolate cookie recipe and add bananas, cinnamon and nutmeg. i bet they'd be amazeballs. Mix all that together, drop on a cookie sheet with a scoop and bake at 375 degrees for 8ish minutes. 2-3 tbsp cream ***sometimes I add a little maple syrup and less cream. Cream instead of milk makes all the freaking difference. I bet if you swapped out bananas for the peanut butter in your recipe and (maybe) threw some cinnamon in there they would come out great! I sort out my feelings verbally as well. My husband has only caught me talking to myself one time in 7 years which is frankly amazing. Sending you so so so much love in regards to your lady parts. You are the little engine that could. You know how that story ends right? PS I am pretty sure there's a new study out that says diet coke increases fertility so you are covered. And by new study I obviously mean crap I made up to make you smile. I made a banana and Nutella cookie a few weeks back, found via Pinterest. They were cakey/bread like and too banana-y for me, so it sounds like this might be exactly what you need! Google it. I love you. The banana bread cookie sounds amaze too. Be strong. 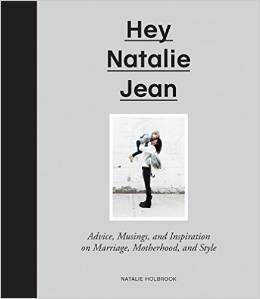 Godspeed, dear Natalie! Beautiful post, beautiful you. I have faith it'll work out for you and you'll be blessed with another bèbe! Loved that you had your mama to "talk at" and be comforted by, so sweet. Enjoy with your folks! I stumbled upon an excellent 3-ingredient cookie. 1 cup sugar, 1 cup peanut butter, 1 egg. 8 mins at 350. DONE. I add cocoa to the sugar first, so they're choco/peanut butter. so so good. so fast. Pioneer women has an awesome recipe pb cookies with on cups. Muffin tins work wonders! I made these a few weeks ago, and they turned out great (I added chocolate chips, of course)! I made banana bread last night...big mistake there is like a sliver left this morning. There is a peanut butter cookie with bisquick, sweetended condensed millk and other awesome stuff. They are "amazeballs" maybe you have tried them but if not they don't disappoint.. I'll try to do them asap!!! ok, so maybe already about 5 million people have told you this, and maybe you wrote why you didn't and i just missed it, but nevertheless i'm going to put it out there and hope to goodness you're not rolling your eyes over the world wide web at me for suggesting that you use a mini muffin pan for this recipe. 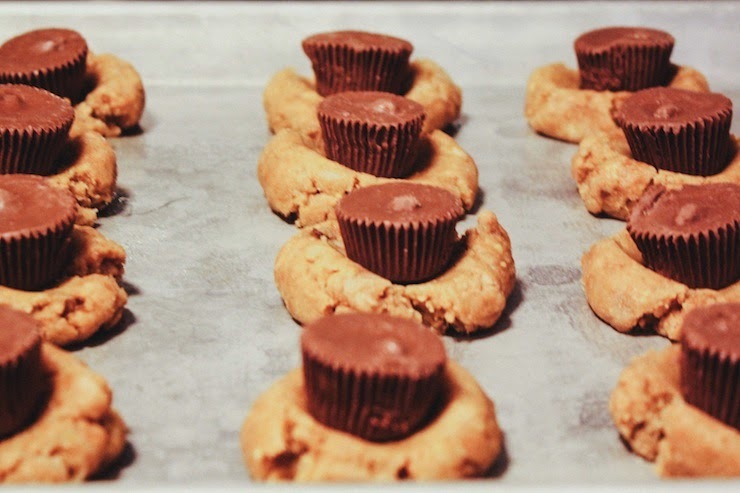 mini muffin pan, fill each mini muffin spot with a rolled up peanut butter ball, then when they come out, push those little reese's cups down into the cookie, and let everything cool in place for about 5 minutes before you pop them out of their little mini muffin cups. DIIIIVINE. promise. yum! 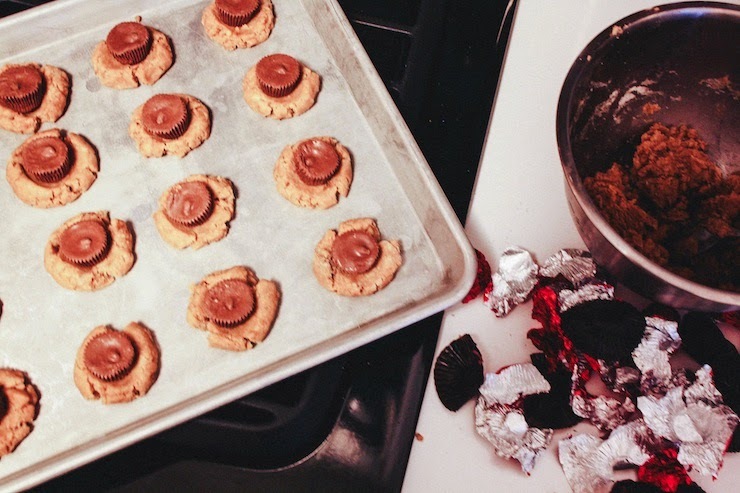 cookies seriously make everything better for that moment in time. thanks goodness for em! Natalie - I am planning on making your cookies tomorrow morning, but am all out of baking soda - and haven't been able to find any at the local stores. Can I just substitute baking powder instead (ie, add extra to the mix), or will I need to head down to the big supermarket to pick up some baking SODA? Natalie! I am planning on making your cookies tomorrow morning, but am all out of baking soda - and couldn't find any at my local stores. Is it okay if I just substitute by adding more baking POWDER, or will I need to head down to big supermarket to pick up baking soda? I baked these cookies for my boss and the girls in the office - they are crazy good. I also ate half of the cookie dough raw before I could get them in the oven. just made these on a whim and I actually had these ingredients around the house. Wasn't expecting much, plus I am not that big of a fan of peanut butter cookies. THESE CAME OUT AMAZING. Thanks for the recipe!